Gerhard Herbst jewelry is all handmade one piece at a time, forging with anticlastic raising to create dimension and volume in each design. He hammers the material, stretching and compressing the metals (sterling or gold) to a very high temper. 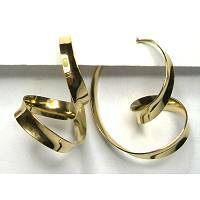 The result is jewelry of superior quality that is durable, FLEXIBLE and STRONG. 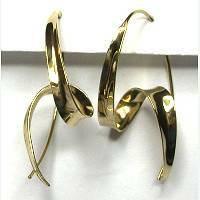 This means you can bend your earring to put it on and remove, no fear that it would break, instead it flexes back into its shapely design. Made in Southern California. 1-1/2 inches long, 5/8 inch across, 3/4 inch deep. Gold vermeil on sterling earrings are forged in anticlastic raising method and hammering for flexibility and strength. The curved channel curls into horizontal twist, with tip meeting at the bottom along with the elongated back earwire. Ultra lightweight. 1-1/8 inches long, 5/8 inch across, 7/8 inch deep. Gold vermeil on sterling earrings are forged in anticlastic raising method and hammering for flexibility and strength. 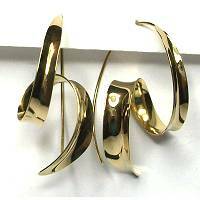 The curved channel curls into horizontal twist along the bottom of the earring forming a large open hoop. Ultra lightweight. 1-3/8 inches long, 3/8 inch across, 5/8 inch deep. 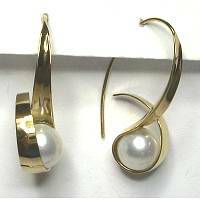 Gold vermeil on sterling earrings are forged in anticlastic raising method and hammering for flexibility and strength. Wire joins to the channel looping outward in the front, capturing a 9mm white pearl at the bottom. Ultra lightweight. 1-5/8 inches long, 3/4 inch across, 1-1/8 inch deep. Gold vermeil on sterling earrings are forged in anticlastic raising method and hammering for flexibility and strength. Hoop formed from round wire joins into tapered and hammered channel that twists to meet the wire at the bottom. Ultra lightweight. 1-3/8 inches long, 7/8 inch across, 1-1/4 inch deep. 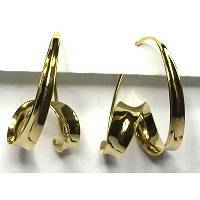 Gold vermeil on sterling earrings are forged in anticlastic raising method and hammering for flexibility and strength. Long curling channel attached to curving wire at the top front for post, that has notch to close in back over the post and form a full loop. Ultra lightweight. Read about what others think of Gerhard Herbst jewelry! Instead of reviews for a specific product, this is a place to share about the designer line in general.